By default, we are all always busy as a matter of course. Life just gets hectic when you combine taking care of children and our families, working, making time for friends……and then a glance at the calendar shows that the holidays are rushing towards us! But perhaps this trick system of pre-chopped onions will help save at least a bit of time in the coming months. 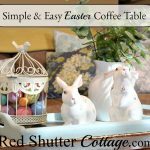 This idea is actually helpful year-round, but particularly helpful when the to-do list seems to expand overnight! I read an article, quite a few years ago, in the Food section of our local paper about pre-chopped onions for cooking. The recommendation was to chop the onions, spread them out on a cookie sheet, freeze them, and then store them in plastic bags in the freezer. It’s a good idea, but instead of the whole ‘cookie sheet in the freezer’ step, I just thought it would be easier to chop the onions, bag them up, and off to the freezer they go. I enjoy cooking; the process, the alchemy of heat and food, the smells, and the anticipation of enjoying the final result with my husband, family or friends. But, I don’t love starting dinner by chopping onions. I would rather get to the good stuff: the smell of onions and garlic sizzling in olive oil, sautéing the meat or the chicken, adding the seasonings and spices. So I do this routinely. 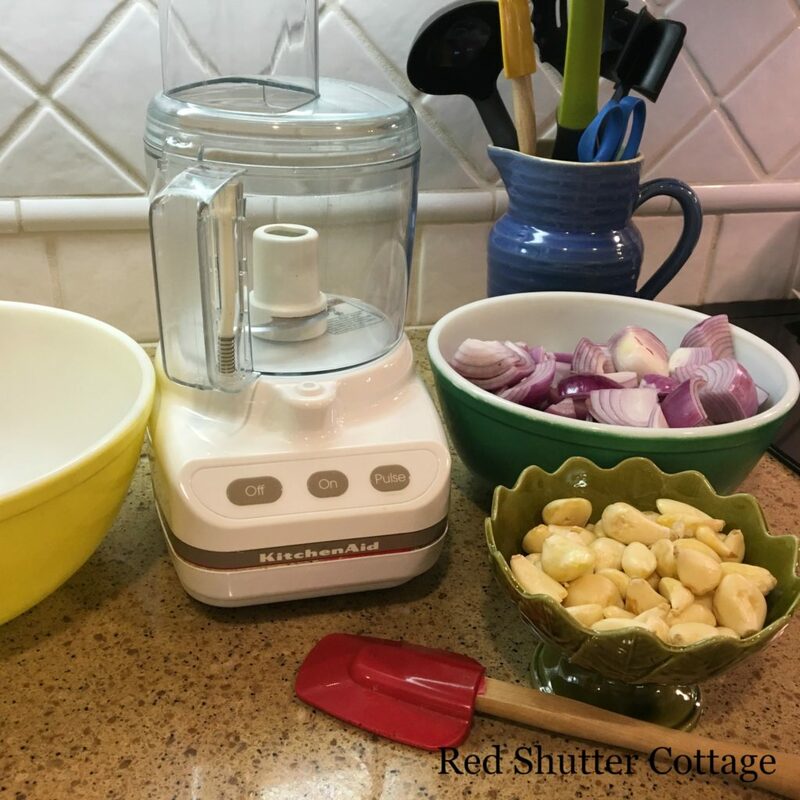 It certainly saves time when I am getting ready to cook a dish for our dinner that week, and it certainly helps to skip over the messy, smelly, eye-watering chore of chopping onions. Now, I am not saying this is fun…. because it’s really not. BUT the rewards far outweigh the drudgery. I gather up a dozen or so red onions (just my personal preference), and a bag of peeled garlic cloves. I put all the garlic cloves into a 2nd bowl and place a 3rd empty bowl on the counter. Down the trap, I send 5 or 6 handfuls of onion chunks and a few garlic cloves. When they are chopped to my satisfaction, the contents are dumped into the 3rd empty bowl. When all onions and garlic have been chopped, I pull out the snack-sized plastic bags, and fill them with the onion garlic combo, and seal. (Note- I don’t measure the amount that goes into the bags…but if I had to guess, it’s roughly ¾ of a cup.) This combination of a dozen red onions and about half of a bag of garlic cloves usually yields about 15 – 20 smalls bags of chopped onion. The little bags go into a larger freezer bag, and those bags are stored in the freezer. 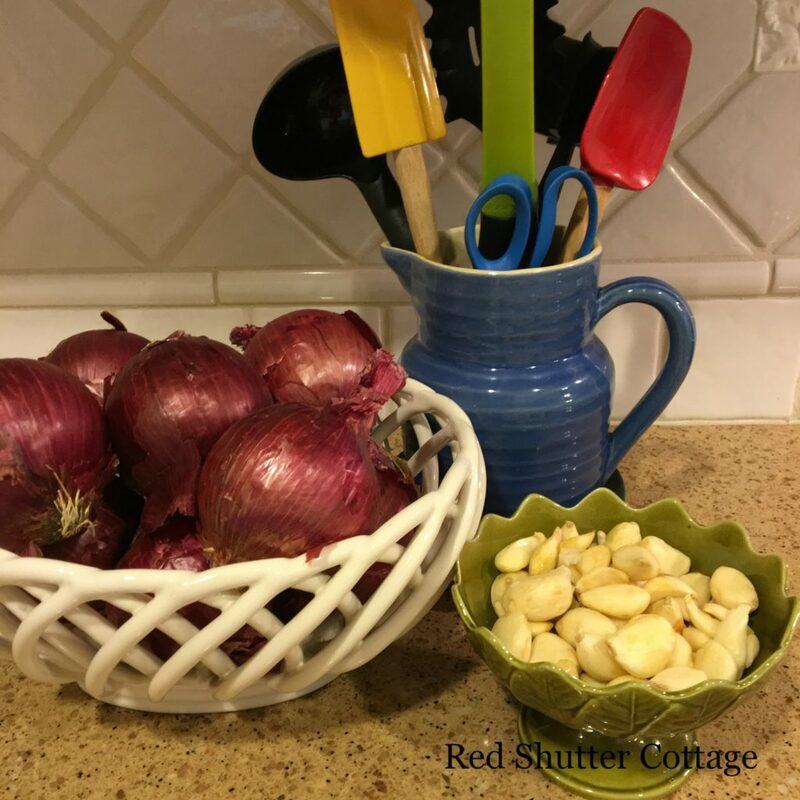 Now, for a special dish, a birthday dinner, or when we have company for dinner, I do use fresh onions and garlic that I chop up (see “messy, smelly chore” above!). 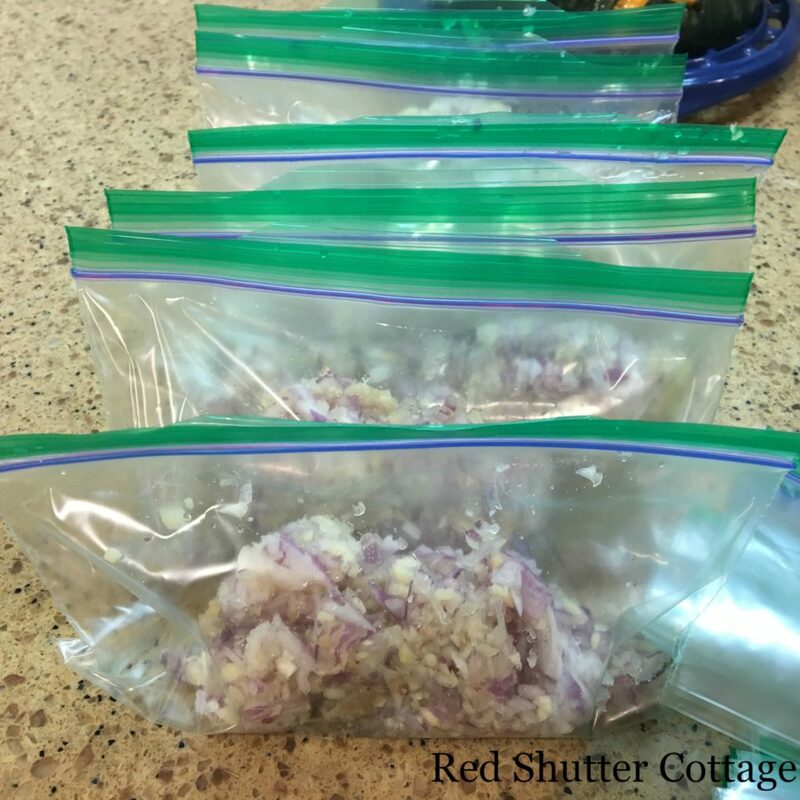 But for the weekly cooking; soups, enchilada casserole, chili (Confetti Chili for The Big Game Day), or baked spaghetti, these little bags of frozen onion and garlic really make cooking more enjoyable! Frankly, the whole process really takes an hour to an hour and a half. But for the next 2-3 months, I have a ready supply of chopped onion and garlic. It is definitely a helpful kitchen time-saver, useful for any time of the year, but especially valuable for when life gets a little crazier than normal. Great idea! I have a feeling that I’d have to measure everything out because I’m more of a recipe follower than you are. But, there’s no reason I couldn’t place a whole chopped onion in each bag. This is such a great tip! Do you ever read Kitchen Stewardship? 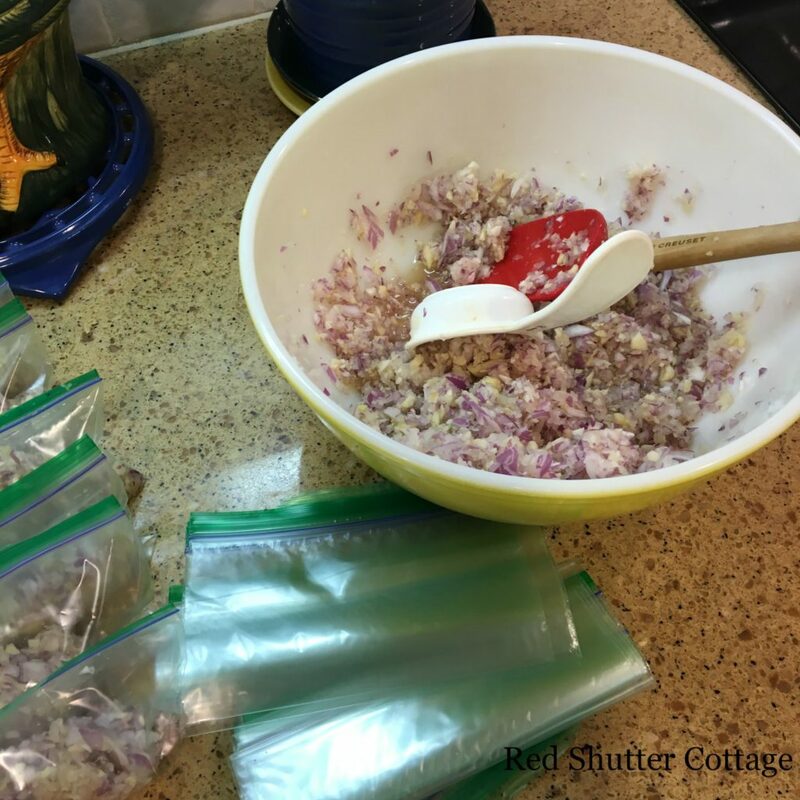 I’ve been reading it for years (and am now a contributing writer) and Katie was always raving on about her recipe-sized bags of chopped onion in the freezer. I finally tried it when onions went on sale. It really is convenient having them all ready to go! Do you thaw yours before use? I usually do, but when I haven’t planned ahead, I just start cooking with the heat a little lower and gradually break apart the frozen onions with the spoon or spatula, and they turn out fine in the end. It’s worth mentioning, though, that you can’t use onions that have been frozen in recipes that call for RAW onion. The texture is very different. I freeze a lot of vegetables in convenient recipe portions and also grated cheese–it turns out much better than cheese that is frozen in a block. Becca – I am not familiar with Kitchen Stewardship, but it sounds interesting! (I got my idea about chopped frozen onions from an article in the Food section of the newspaper.) If I am on top of things and organized, I do pull out the bag(s) before I start cooking, so they can get to room temperature; if not I toss them in the microwave for 30 seconds, and that does the trick! Thank you for the links to the articles; I will definitely look into them! Thank you, Linda! It most certainly is a timesaver. But even more, when you want to cook something, and all you have to do is pull out a bag of onions to get started, you get to the good part of cooking a lot faster! I still get a little zing out of that feeling! Kristine, I think I need to do this. It’s never worth it to get out the food processor to chop onions for one meal, but it would be just the thing for chopping onions for many meals. 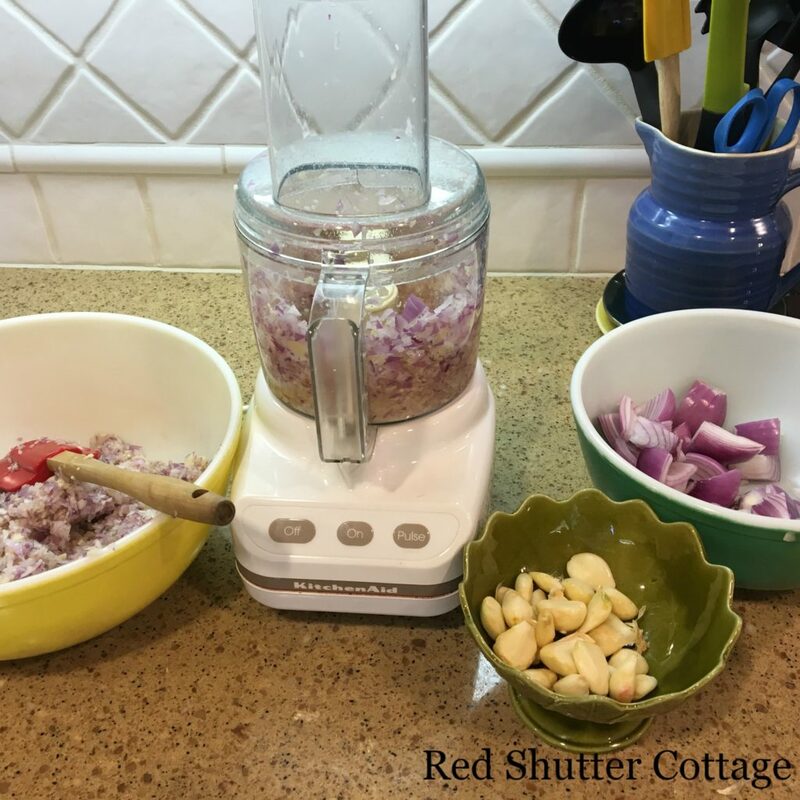 When chopping onions, I have a special way of dealing with the tears (you can find it in my recent French onion soup post – I won’t be spammy and include the link in my comment). Thank you Jean – I hopped over to your French onion soup post! I have never even heard of goggles, but will definitely look into it! And you hooked me with your French onion soup recipe! I definitely want to try that!